When it comes down to it, we’ve probably spent the most tiny house research time on building envelope systems. The building envelope is what protects the inhabitants of the house from wind and weather, and it’s made up of siding, air barrier, sheathing, and insulation. And if you ever talk to any architect about this, they’ll tell you that building envelope science is a murky world of half-truths and maybes. Folks, this ain’t easy. Using information from articles like the ones here, here, here, here, and here, we determined that we want a vapor-permeable air barrier to wrap around our house. This will keep drafts and water out, but will allow water vapor to diffuse in and out of the house. We decided against a vapor barrier on the inside of our walls thanks in part to the sheep’s wool insulation we plan to use. We came up with these decisions because we’re concerned about water condensation and mold buildup in our tiny house, which are issues for tiny houses in general, but also for Christine in particular. We’re happy to talk about this in more depth! But frankly, building envelope science doesn’t interest most people, so if you want to know more please ask in the comments. We decided to use the product Henry Blueskin VP100, which is a residential grade vapor-permeable air barrier that is locally available. It’s self-adhesive, like a giant sheet of sticker, and it seals itself at the seams. 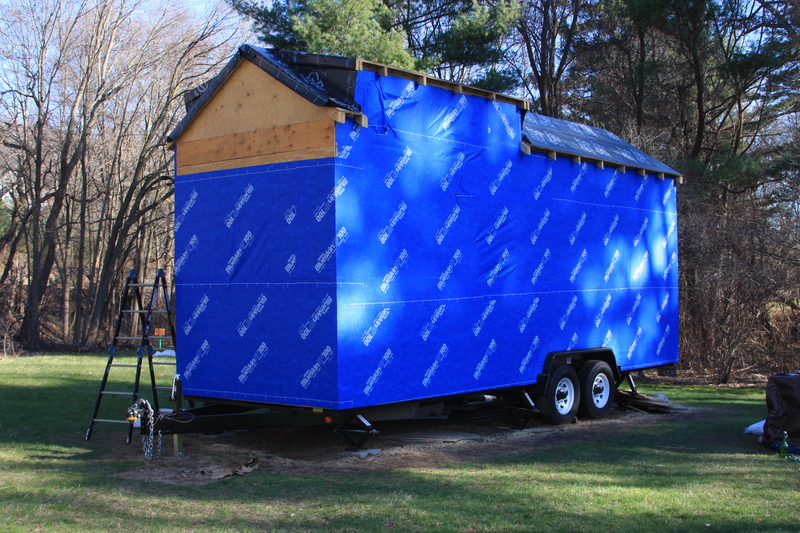 For our first step, we routed out each window opening, and then spent the better portion of two weekends sticking the Blueskin to the outside wall sheathing. The difference it made to the inside of the house was noticeable immediately. Stepping into the house at mid-morning this past weekend, we realized the house felt stuffy. And this with a gaping hole where the door goes! No more airflow through the cracks between our sheathing. I’d call that a success. One area of the house where we paid particular attention was at the wheel wells. We left a 1/4″ to 1/2″ gap between the plywood and wheel wells of our house. This is so water can’t condense on the metal wheel wells and then be absorbed into the plywood, making for a weak point in the walls where mold can occur. However, we also wanted to make sure water couldn’t migrate into the house through this gap and soak our insulation. This is another problem particular to tiny houses. Tumbleweed doesn’t address this with their trailers (although they might in their house plans, I’ve never checked), but there is a trailer company that has an optional welded flange all around their wheel well. You’re supposed to build your walls so that the plywood sits just on the outside of the flange, which prevents water from creeping in to your house. It’s a pretty cool solution, but it’s one that we didn’t have, and I’d still be concerned about water condensation where the metal touches the plywood. We opted to use EPDM rubber roofing flashing tape at our wheel wells. It feels like a long rubber sticker, and we stuck it to the wheel well and then up onto the walls. Our housewrap came down over the EPDM. We’re not sure how it will hold up long term, but it seemed like a good option, and it provides a thermal break between the metal wheel well and the wood walls. We’ll see how it goes. You can see that it pulled away a little bit from the corners after a week or so on the trailer, so we did have to cut and patch it once already. But overall, we’re pleased with how it came out. We’ve got high hopes! Next up is roofing, and after that will be windows, the door, and siding. And then we can start work on the inside. Is that supposed to be the easy part? All links in this post are non-affiliate.